Natasha Trethewey is the author of Native Guard (Houghton Mifflin, 2006), and Bellocq’s Ophelia (2002) and Domestic Work (2000), winner of the first Cave Canem Poetry Prize, both from Graywolf. Among her many honors are the Grolier Poetry Prize; fellowships from the John Simon Guggenheim Memorial Foundation, the NEA, and the Money for Women/Barbara Deming Memorial Fund; and a Pushcart Prize. Her work has been widely published and collected in various anthologies, including in The New Young American Poets (Southern Illinois, 2000), Literature: An Introduction to Fiction, Poetry, and Drama (Longman, 2004), The Oxford Anthology of African-American Poetry (Oxford University, 2005), and twice in Best American Poetry. 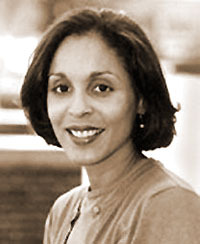 Trethewey is an associate professor of creative writing at Emory University and is currently Writer in Residence at Duke University.